Here’s another reason why narrating the story in the present tense might be misleading, or at least weird. It’s because time is out of joint between the making-of and the made. In diagetic time, Stephen and Martin are the two guys walking out of the bar in the opening scene. They part ways, and the narrator follows Stephen on his solitary walk down the block from Martin’s office. Diagetically, this is a single continuous scene. From the making-of standpoint it is not. The opening scene in the bar and the beginning of the out-the-door stroll were written in November 2010, but the passage in which Stephen happens upon the Salon Postisme was written much earlier. I don’t even know quite when I did write it. In November 2003 I incorporated the bit about Hanley finding the Salon into an earlier version of this book, but the annotation I wrote at the time indicates that it was a fragment “imported from prior work.” I probably wrote it sometime in 2001, but I can’t put my hands on the original. Between one sentence and the next in the same paragraph there’s a gap of nearly ten years. Portals, intervals, alternate realities. In the beginning, Genesis 1 reads like a continuous narrative: only the small and ubiquitous Hebrew conjunction and separates the Bible’s first two references to the earth. But doesn’t the continuity convey the impression that the Elohim did not create the universe ex nihilo, but rather that he (or they) came upon a pre-existing formless void and organized it? That’s heresy. To reconcile the canonical text with orthodox theology sometimes calls for hermeneutical creativity. Advocates of what has come to be known as Gap Theory propose that something went wrong between verse 1, when God created the earth, and the formless void of verse 2. Perhaps an extended interval should be inserted between the first two verses, an interval that lasted for eons. Geologic eras came and went; ice ages alternated with times of tropical warmth. A wide array of life forms emerged and thrived. Maybe even the primates, even those which paleontologists regard as forerunners of homo sapiens, appeared on the scene. Then some sort of widespread evil corrupted the earth, causing everything to wind down and to fall apart. Floods and earthquakes, volcanoes and meteors disrupted land and sea and sky; every species went extinct. What had been created as an orderly world degenerated into the formless void of Genesis 1:2. There’s something alluring about the idea of opening up the tiny space between verse 1 and verse 2 and seeing inside of it an entire prehistory of the world lasting billions of years. It’s an exegesis based on the space between words, on the absence of written evidence – as if the meaning of the text is to be found not in the words themselves, but in the spaces between the words; as if all Biblical meaning consists of what is not written. The first sentence wraps up the seven-day creation narrative; the second introduces the Garden of Eden story. There’s not even a chapter break separating these two accounts: one follows the other as part of Chapter 2. But the details of the creation as it unfolds are not compatible between the two accounts. In the second story Yahweh creates Adam out in the desert, then he plants a garden in the east, then he brings Adam into the garden to tend it, then he creates all the beasts and birds and brings them to Adam so that he can name them. It reads as if the gods (elohim is a plural noun) created the larger world first, and then later one of the gods, named Yahweh, created his own microworld inside that larger world, in the desert of the Real as it were, outfitting it with his own plants and his own gardener. But what about the sequence in which these creation narratives were written — the making-of of the Making-Of? The Documentary Hypothesis contends that the Garden narrative was written hundreds of years before the Seven-Days narrative, and that only later did redactors reverse the sequence in the canonical merged text. Now the Seven Days can be read as a just-so story contrived by priests for justfiying landowners’ exploitation of peasants. Why do we have to work six days straight, with only one day off? Because that’s how God did it. And why do we have to go to temple? Because God blessed and sanctified the seventh day. For the landowners that sort of mystification must have been worth the ten-percent tithe. Of course it’s only a hypothesis: the originals can no longer be retrieved from the archives. If there’s one book that has exerted the greatest influence over my fictions, it’s the Bible. Here we find a congeries of textual fragments, written by many authors in many styles over hundreds and hundreds of years, cobbled together into a single, continuous, third-person preterite narration. But the seams and the sutures are still evident in places. Prying them open, the reader gets a glimpse into the tohu vabohu, the Formless Void, on whose surface the whole Creation bobs along like a flimsy raft. Yesterday I was carrying two bags of groceries in from the car when I stopped dead in my tracks. 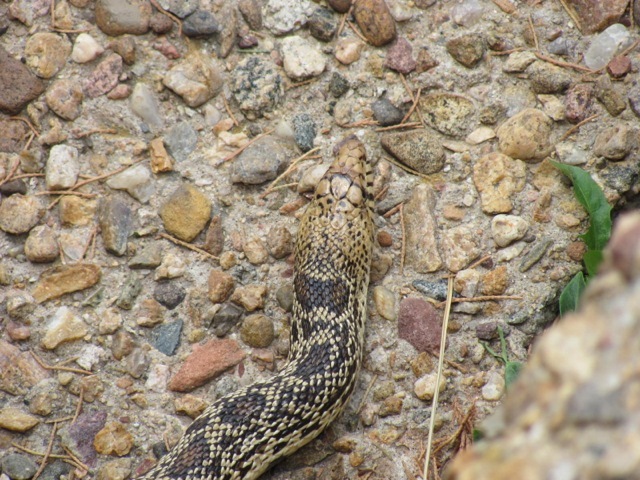 There, lounging across the top two steps of the front porch, was a bull snake. He was a robust specimen, at least five feet long and nearly as thick as my wrist. I showed him respect, going around to the back door. About ten minutes later he slithered off through the undergrowth. This morning I found myself thinking about the other time I posted about a snake encounter. Most of my blog posts have a short halflife. People give each new post a look, then maybe they participate in or follow the discussion for a few days. After that the post sinks rapidly in popularity. Then there’s the Ouroboros post. I put it up mid-afternoon on 17 April, and it got 15 page views that day. The hits jumped to 105 the second day, then down to 68 the third and 46 the fourth. After that the post followed the usual pattern, with the hit rate dropping to 0-3 per day. Then the post rose from the dead. Traffic abruptly picked up again: 20 hits on the 18th day, 60 on the 19th, 38 on the 20th, 49 on the 21st. Since then the hit rate on this post has never dropped below 57. Yesterday, six weeks after I first put it up, the Ouroboros post was viewed 62 times; two days earlier there had been 104 hits. While I think the post is a good one, I doubt that people are showing up because they heard about its merits through the grapevine. More likely people are googling the word “Ouroboros” and my post pops up. Is there some sudden interest in this fairly obscure term — has, for example, a movie or an album with that title recently been released? Not that I can see. Maybe there are lots of Gnostics and alchemists and Jungians out there looking for content. But that doesn’t explain why the post went dormant for two weeks before experiencing a renewal. Surely it didn’t take that long for the search engines to find it. 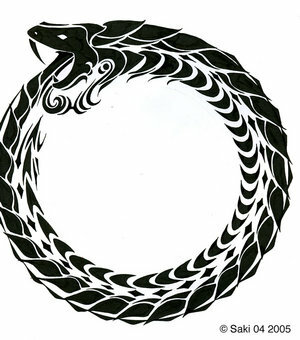 The Ouroboros often represents self-reflexivity or cyclicality, especially in the sense of something constantly re-creating itself, the eternal return, and other things perceived as cycles that begin anew as soon as they end (compare with phoenix). Yesterday I received an email from my old buddy Steven Pinker. Well, it’s not like he’s a really close friend: about three years ago I quoted him in my nonfiction book about Genesis 1 and sent him the relevant passage, which he commented on. So I guess I got automatically stored in his email directory. Anyhow, my pal Steven wanted to let me know that his wife, Rebecca Newberger Goldstein, had just published a new book called 36 Arguments for the Existence of God: A Work of Fiction. The “he” who serves as subject of this sentence is the Apostle Paul, on whose writings I’ve written frequently at Ktismatics. The sentence appears on page 200 of Charles Freeman’s The Closing of the Western Mind, a book which I found in the giveaway box at the local library and which I’ve not yet read. According to the back cover, the book traces the decline of scientific and rational thought in the West as a consequence of Constantine’s consolidation of a Christianized Roman Empire in the fourth century. Previously the church had emphasized the Gospels, in which Jesus is presented as a Jewish national hero and a rebel against Roman authority. After the crucifixion Peter had sustained the essential Jewishness of Christianity. Paul, on the other hand, universalized the Christian faith to embrace Romans and barbarians alike, imposed a hierarchical church authority structure, and counseled cooperation with the political authorities — an approach that proved much more compatible with the consolidation of the Empire. Augustine emerged in the fourth century as the pre-eminent Pauline theologian and enforcer of a standardized Christian dogma. So, like Rebecca Newberger Goldstein, I’ll continue incorporating religion into the fiction I write, as long as it stimulates my imagination and contributes to my glee. Beginning is going on. Everywhere. Amidst all the endings, so rarely ripe or ready. They show up late, these beginnings, bristling with promise, yet labored and doomed. Every last one of them is lovingly addressed: “in the beginning.” But if such talk — talk of the beginning and the end — has produced the poles, the boundary markers of a closed totality, if “the beginning” has blocked the disruptive infinities of beginning, then theology had better get out of its own way. “In the beginning, God created the heavens and the earth, and the earth was formless and void,” is how most translators render the first verse of Genesis. Keller follows the eleventh century Jewish commentator Rashi by reading it thusly: “When, in the beginning, God created the heavens and the earth, the earth was formless and void.” This way the formless void already exists when God the creator arrives on the scene, making the story correspond more closely to Greek and other Ancient Near Eastern cosmogonies. The formless void, or tohu vabohu, isn’t a vacuum, but rather a hodgepodge, a farrago, a blooming buzzing confusion. It’s the immanent flux, the primal source of inchoate and protean difference from which all things form themselves. The word for God in Genesis 1 is elohim. It’s a plural noun that usually takes a singular verb conjugation. Commentators often construe the plural as an indicator of plenitude or intensity, as if this one god is so far above all other gods as to merit the all-inclusivity of a plural ending. Keller suggests that the plural be regarded as an indicator of an “originary multiple without individuation,” a “swarm” a “differential unity,” a “co-creative collective.” Interpreted in this way elohim is not unlike the tohu vabohu of the pre-creation universe. I respect the effort that Keller puts into these related moves to immanentize the transcendence of the Biblical creation story. In my view, while each of these textual moves is clever and could possibly represent what some earlier version of the text might have said before it got “theosized,” the Hebrew text as written doesn’t really support these alternative wordings. Still, if you’re looking for a way to reconcile the Judeo-Christian texts with the way the universe really did come into existence, then Keller offers a coherent and only mildly distorted rereading. I make similar small moves to tell my own version of the Genesis 1 story, so I can relate. If she really believes that this is what the Bible narrative is saying, then she must accept that those early anonymous writers really were inspired beyond any possible human knowledge. And to regard the process of emergence itself as divine is not without precedent in the history of ideas. But why not just go all the way and assert that the writer of Genesis 1 is describing a materialistic process of creation where the gods don’t have any role whatsoever?